Mississinawa Valley’s Justin Miller flies in for a layup against Cross County Conference host Twin Valley South on Friday night. The Panthers won the game, 74-42. Mississinawa Valley’s D.J. Howell pulls up for a jump shot against Cross County Conference host Twin Valley South on Friday night. The Panthers won the game, 74-42. Mississinawa Valley’s Max Dirmeyer looks to get around a Twin Valley South defender during a Cross County Conference matchup on Friday night. The Panthers won the game, 74-42. Mississinawa Valley coach Tim Barga talks to his players during a time out of their Cross County Conference game at Twin Valley South on Friday night. The Panthers won the game, 74-42. 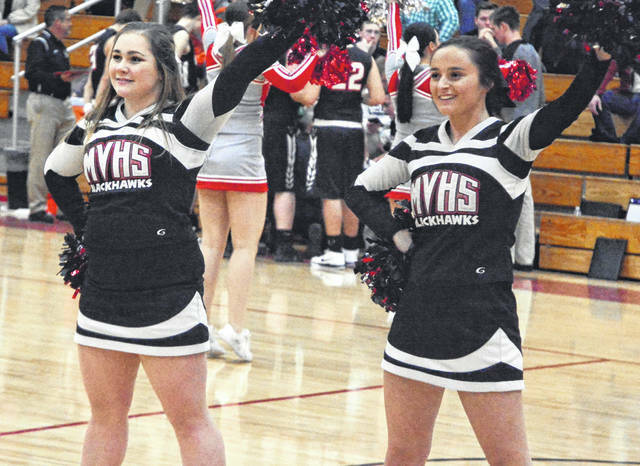 The Mississinawa Valley varsity cheerleaders perform for their fans during a break in the action of the Blackhawks road game at Twin Valley South on Friday. TVS won the game, 74-42. 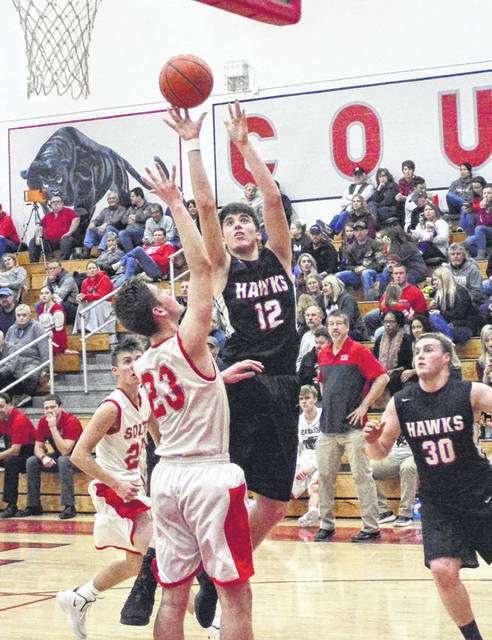 Mississinawa Valley’s Trent Collins puts up a shot against Cross County Conference host Twin Valley South on Friday night. The Panthers won the game, 74-42. 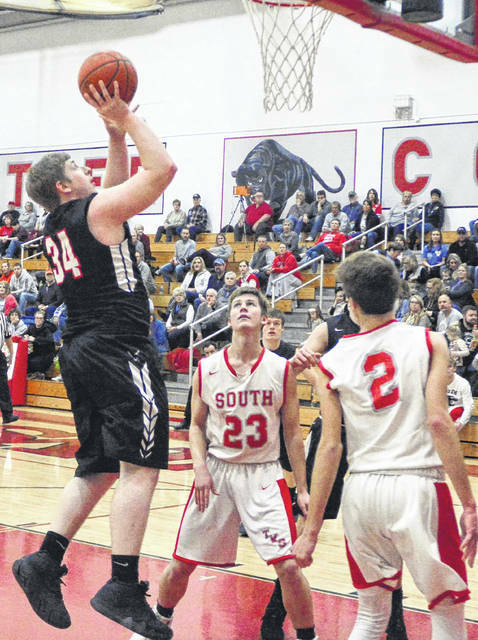 WEST ALEXANDRIA – Visiting Mississinawa Valley had its hands full against host Twin Valley South on Friday night. West Alexandria is a tough venue for visiting teams and South is having a very good year. To make things even more difficult for the Blackhawks they were down one starter for the weekend. Blake Scholl was injured during practice making it too many obstacles to overcome and South would win pulling away, 74-42. 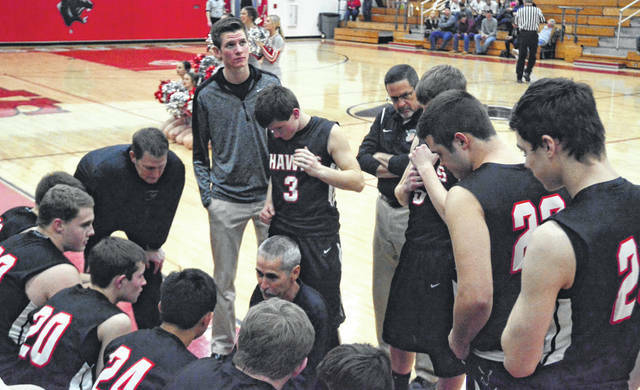 Blackhawks coach Tim Barga tried several different lineups to try and confuse South. Having a deeper team gave him some options. They went with a smaller, quick lineup to speed up the game and get some defensive turnovers. Later they tried a beefy boy lineup utilizing D.J. Howell and Cody Dirksen with their size in the paint to counter South. “D.J. Howell has played well for us this year. He plays physically and he did well tonight. He tried to step it up with Scholl out of the lineup,” Barga said. Another thing that the lineup changes did was keep fresh bodies on the floor. South only dresses seven for varsity, so rotating players to get some air and keep them fresh made sense strategically. South pressed intermittently, they did get some turnovers and kept the Blackhawks from getting a good flow going on offense. Still, the Blackhawks managed to keep the game within striking distance in the first half. It was 16-9 at the end of the first quarter and 27-18 at halftime. Keeping the game low scoring was in the Blackhawks favor. However, that was not to be as in the second half South found another gear and began to open its lead. In the first half the Panthers got a lot of points from driving to the hoop, but in the second half they found their range from beyond the arc and began to rain treys. 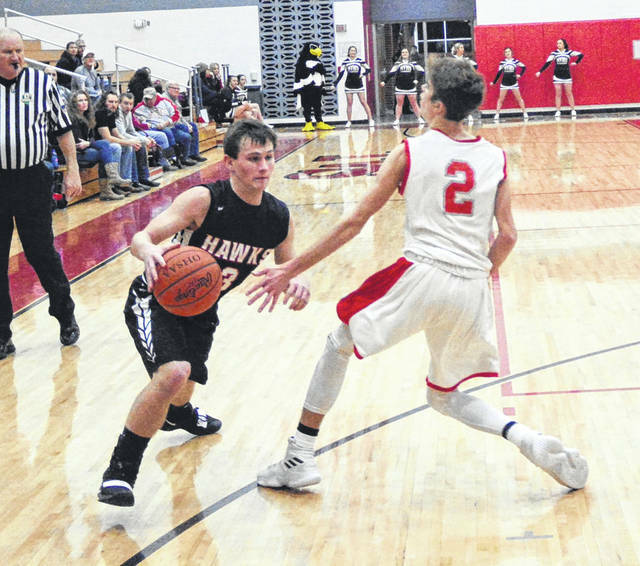 TVS opened a 46-30 lead as the Blackhawks struggled to score. They could not match the pace of the Panthers. South kept up the offensive and defensive pressure in the last quarter as the Blackhawks emptied their bench. 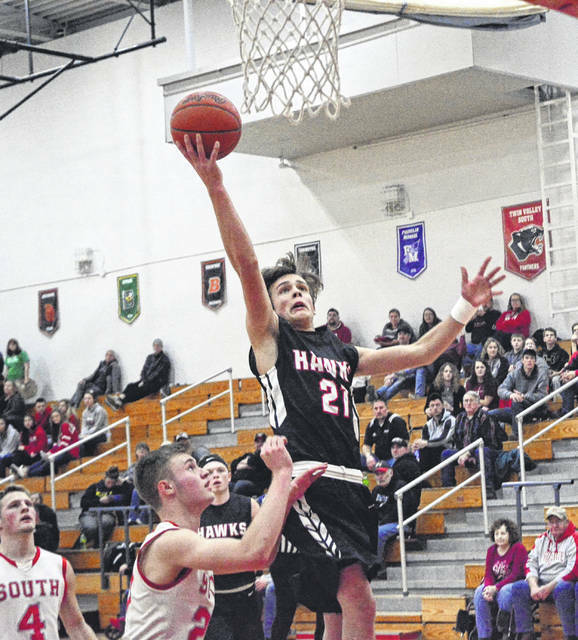 Scoring for Mississinawa Valley: Max Dirmeyer 5, Will Hall 2, Trent Collins 4, Alex Scholl 1, Kyler Guillozet 5, Justin Miller 2, Mason Hiestand 3, Xavier Manning 1, Josh Fett 5, Cody Dirksen 4, D.J. Howell 10.